The Norwegian Elkhound is one of many breeds of the Spitz family, or, as they are often referred to, the Northern Breeds. Throughout its history this multi-talented breed has been used as a herding dog, sled dog, guardian and hunter. As its name implies, it is from Norway, and it was used (and still is) to hunt elk, as well as other game such as moose, bear and wolf. They are believed to be a very ancient breed, with ancestors known in Viking times. In Norway, only dogs that qualify in the Norwegian Hunting Trials may be awarded the title of breed champion. The gray coat color is usually darker in European members of the breed. Even when used as a hard hunter, they make a wonderful family pet. This breed was first imported into England after World War I, then to Canada in 1928. 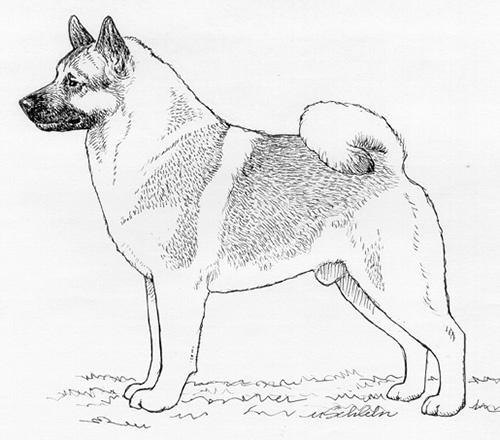 The Norwegian Elkhound was recognized by the United Kennel Club in 1948. The Norwegian Elkhound is a typical spitz breed, with a square profile and a compact build; medium in size and substance. He has erect ears, a tightly curled tail and a thick, abundant grey coat that is not overly long or bristling. Courageous, alert, hardy and strong, the Norwegian Elkhound remains true to its hunting and working heritage. The breed is bold and energetic in temperament and makes an effective, yet friendly guardian and a devoted family pet. The head is wedge shaped and lean, with no loose skin. Fairly broad between the ears, and slightly arched in profile. The stop is clearly defined but not abrupt. The muzzle is the same length as the skull, thickest at the base, and tapers evenly when viewed from above or the side without being pointed. The nasal bone is straight. The lips are tightly closed. The medium sized, oval shaped eyes are dark brown in color. They do not protrude from the skull. The expression is keen and alert, giving the impression that the dog has great courage. Set high, firm and erect, the ears are very mobile. Comparatively small, they are higher than they are wide at the base. The tips are pointed, not rounded. When the dog is listening, the ear orifices are turned forward. When the dog shows affection or is relaxed, the ears go back. The neck is medium in length, muscular, well set, with a slight arch and no loose skin on throat. The shoulder blades are sloping. The upper arms are moderately sloping, and the elbows are held close to the body. The legs are straight, strong and firm, set well under the body, and of medium length. Bone is substantial, but not coarse. The pasterns are strong and only slightly bent. Single dewclaws are acceptable on the front legs. The body is short, powerful and compact. The chest is deep and moderately broad. Well-sprung ribs account for most of the body length. Highest at the withers, the back is straight and strong to the set on of the tail. The loin is short, broad and muscular, and the croup is broad and strong. The hind legs are strong, lean and muscular, with broad upper thighs and a lower thigh of medium length. There is moderate angulation at both the stifle and the hock. The feet are rather small and slightly oval, with thick pads. The toes are tightly closed. The feet turn neither in nor out. The tail is set high, and is tightly curled and carried over the centerline of the back. The hair is thick and close, without brush. It is always left natural and untrimmed. The thick, hard, weather-resistant and smooth-lying coat is made up of a coarse, straight outer coat and a soft, dense, woolly undercoat. It is smooth, short, thick and rich on the head and on the front of the legs. The neck, buttocks, chest, hind part of legs and underside of the tail has the longest hair. Altering of the coat by trimming, clipping or artificial means is not allowed. Trimming of the whiskers is optional. Show ring presentation is always natural and unaltered. Grey of various shades. The variations in shade are determined by the quantity of the black tips of the guard hairs. The undercoat is clear, light and silver. The muzzle, ears and tail tip are black. The black of the muzzle shades to lighter gray over the forehead and skull. The coat on the legs, stomach, buttocks, chest, underside of the tail and harness markings is lighter, without black tips. Serious Faults: Yellow or brown shading. White patches. Indistinct or irregular markings. “Sooty” coloring on the lower legs. Light circles around the eyes. Disqualification: Any overall color other than gray, as described; such as red, brown, solid black, white or other solid color. The stride is even and effortless at the trot; the back remains level. As speed increases, the dog single tracks. 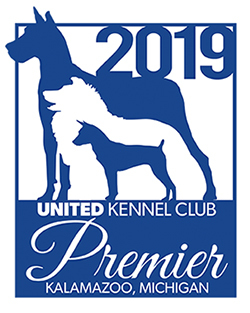 The breed is constructed for agility and endurance, being well balanced in angulation and muscular development; the gait exhibited should reflect these qualities. Height at the withers: Males 20½ inches, females 19½ inches. Weight: About 55 pounds for males; about 48 pounds for females. Any overall color other than gray, as described; such as red, brown, solid black, white or other solid color.